Some of you may recall that Copenhagenize/Copenhagen Cycle Chic were the proud recipients of one of Yahoo! 's Purple Pedal bikes last year. 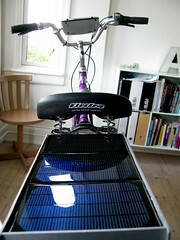 The bikes are equipped with a mobile phone with a camera, which is run off a solar panelled box on the back. It takes a photo every minute when active and instantly transports it back to a Flickr website and the Purple Pedals website, complete with geotag. When the bike is stationary for three minutes, it goes to 'sleep' and will awake once again when it is put into motion. All quite flash. All went well for a good while. I rode it around, for example, when the Portland crew came to Copenhagen on a study trip last fall. Here's a photo series taken by the bike's camera. After that there were some technical difficulties involving... well... technical stuff. I'm pleased to say that the bike is up and running again and, after a week in Copenhagen, the bike is now in Tanzania! My friends at Baisikeli, the development org that sends used Danish bikes to Africa, were given the bike. Henrik, one of the two guys, is in Tanzania for a month to check up on the recieving end and the workshops that convert the bikes into ambulance bikes, water-carrying bikes, etc. He took the Purple Pedal bike with him. I just checked the photo stream on Flickr and there were a couple of hundred black photos from inside the bike box on the plane but it is now registering geotags from Dar es Salaam airport. COOL! I had a few discussions with Yahoo!, who generously helped get the bike to Tanzania, about whether the US phone would work in Africa, where most mobile networks are European. So I'm thrilled that the bike looks like it's working. You can follow the bike's journey in Tanzania on this Flickr photostream. If you're in Copenhagen this spring or summer, you may get the chance to ride the bike if you rent a bike from the Baisikeli bike rental shop here in the city. Here's a video I made when the bike arrived in Copenhagen. 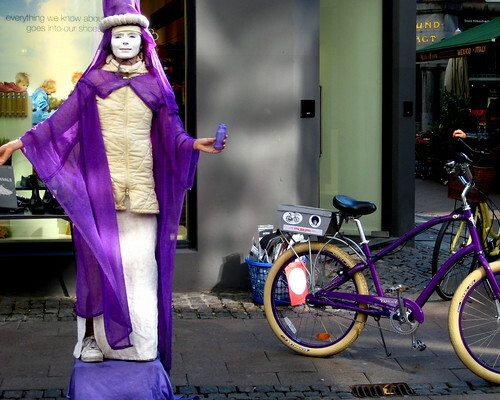 You can see all the bikes around the world on the microsite for Purple Pedals here.